from 15 pcs. 1,03 EUR ea. Strong rod magnets. In this photo with a steel sphere in the centre. In the additional photos, you can see the magnets also in combination with other magnets. Every rod magnet is so strong, that each can hold 80 additional rod magnets without a problem. Also suitable as a compass. 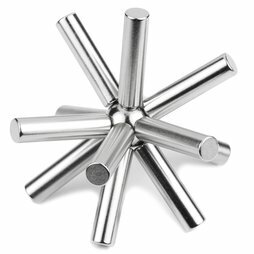 The free-swinging rod made of 8 rod magnets aligns itself to the north-south poles.